The report of the Colorado Local Resilience Project, convened by the Colorado Climate Network and the Colorado Municipal League, was released on April 23, 2015. 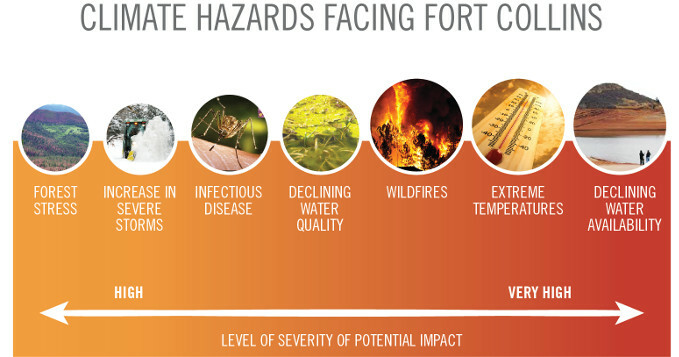 The report is a call for action – for more steps by local governments, the Colorado state government, and others to improve the resilience of Colorado communities to climate change-related risks, including increases in wildfires, floods, and health-threatening heat waves. Former City of Fort Collins Mayor Karen Weitkunat and other City staff participated in the process along with 78 representatives from 30 local governments and six related local organizations to develop the report, which contains six conclusions and 36 recommendations, all representing a consensus of the project participants. Read a recent report about the City's climate action strategies and the role of the City in assessing the community's vulnerabilities to climate change. The City of Fort Collins Recreation Department is planning now for future challenges related to wildfire smoke, poor air quality and increased heat. This case study highlights our lessons learned from the 2012 High Park Fire and how we’re planning now to manage future conditions to ensure our Recreation program participants are protected and informed. The City remains committed to reducing greenhouse gas emissions (GHG) through multiple strategies. In 2015, Mayor Wade Troxell signed the Compact of Mayors agreement, joining over 600 other cities, committing Fort Collins to completing a full climate action and adaptation plan by 2018. Fort Collins already has a comprehensive Climate Action Plan and will be completing a municipal adaptation and resiliency plan in 2018. Together, these plans will ensure Fort Collins continues to be a safe, prosperous place to live and is resilient to its challenges now and in the future. Many mitigation and adaptation strategies offer benefits to both efforts. By mitigating emissions locally and globally, we can help prevent future climate impacts from becoming more severe. Go tohttps://www.fcgov.com/climateaction to learn more about how you can help fight climate change and participate in a variety of city programs to improve your home or business. Why Do We Need To Prepare For A Changing Climate? While we must make concerted efforts to reduce greenhouse gas emissions, historic emissions have and will continue to impact our climate. Climate change is an urgent challenge that requires us to develop and leverage extraordinary capacity for resilience and innovation across sectors. In 2012, throughout the nation there was record heat and drought. Locally we suffered record wildfires that impacted the Cache la Poudre watershed- a key source of water and pride for Fort Collins. In 2013, the Colorado Front Range experienced extreme flooding that killed people, destroyed homes, business and public infrastructure. Climate science indicates we should expect more of what we saw in the last two years in future. After more than a year serving on the President's State, Local and Tribal Leaders Task Force on Climate Preparedness, Fort Collins Mayor Karen Weitkunat saw her hard work come to fruition with the release of the Task Force's recommendations. Read more here. The President's Climate Preparedness and Resilience Task Force (Task Force) was convened to develop recommendations on how the federal government can better support local, state and tribal governments in achieving resilience through disaster preparedness, built systems, natural systems and agriculture, and community development and health. Remove barriers and create incentives and otherwise encourage investments in resilience. Provide useful tools and information, including through intergovernmental coordination. Otherwise support state, local, and tribal preparedness for resilience to climate change. The Built Systems Subgroup is soliciting input in developing recommendations specific to: water, transportation, energy, facilities, and coastal infrastructure in addition to program and agency administration. Please consider contributing to this process with a brief response to the questions presented below with particular consideration to those actions that can be advanced in the short term and which will have the most impact. For more information, please view the Climate Preparedness and Resilience Task Force page.